$15 entry for Cars. $10 entry for Bikes. Gates open 8am. Judging starts at 10:30am. Trophy presentation around 2:30pm. Open to all Veteran, Vintage, Classic & Modern Cars and Bikes. Over 50 trophy categories for specific models and years plus also best club display, people’s choice, best Ute, best Panel Van & best Hot Rod. 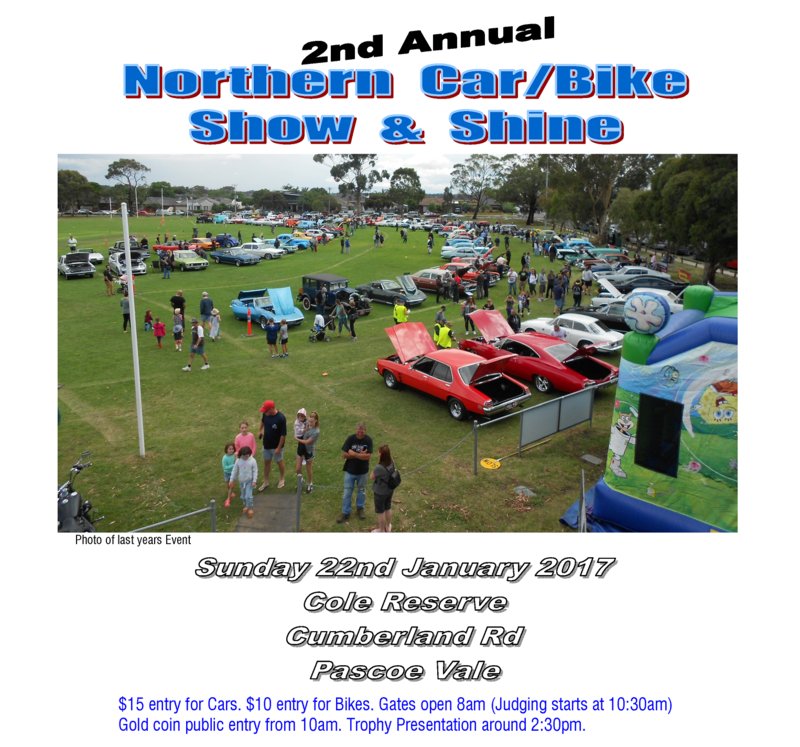 Individual categories for Monaro, GT, Torana, Mustang, Corvette, Camaro, Customline, Charger, HSV/FPV & SS. There are 9 categories for motorbikes including best scooter. There will be a live band, bbq, ice-cream van, coffee van, canteen and plenty of activities for the kids including a jumping castle. Last year’s event was a great day and we are hoping on getting bigger and better by using last year’s feedback. This is an event hosted by St Andrews Pascoe Vale Cricket Club with the supported charity being Crohn’s & Colitis Australia. Come support a great cause. Check website prior to event in case of inclement weather.